Do you battle with a too-small kitchen that simply cannot accommodate all the cooking tools and utensils recommended by celebrity chefs? Or maybe you prefer a minimalist lifestyle and you are looking for ways to achieve that without giving up gourmet meals. 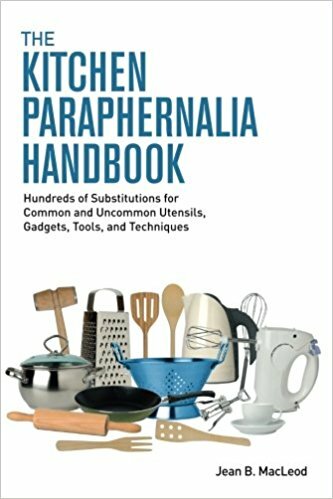 If so, then The Kitchen Paraphernalia Handbook: Hundreds of Substitutions for Common and Uncommon Utensils, Gadgets, Tools, and Techniques, by Jean B. MacLeod, offers the perfect resource for you. The Kitchen Paraphernalia Handbook is the ultimate kitchen reference book you didn’t know you needed. The text is organized in alphabetical order as it presents many common and uncommon cooking implements and utensils (collectively paraphernalia) that you might need. The catch is that it offers the perfect way (and sometimes multiple ways) to get by without those specific tools and gadgets. For example, if you are making bread and the instructions call for a Banneton, which may be an item you never heard of and certainly do not have on hand (it is a willow basket used to proof the dough), MacLeod suggests instead using a colander or a glass mixing bowl that you line with any linen dish towel. Alternatively, perhaps you want to make mom’s meatloaf recipe, but you lack that classic meatloaf pan. MacLeod offers four different solutions with more common tools you might have. Such tips allow the average home cook to expand their cooking abilities without expanding their collection of kitchen paraphernalia. These techniques can help even more seasoned chefs work around any limitations they might face in an unfamiliar kitchen setting. MacLeod’s text does have a few drawbacks. The first would be that it lacks any sort of introduction that might help orient the reader to the text. MacLeod’s high level of organization and attention to detail suggest she is a herself either an experienced cook, a kitchen minimalist, or just an inventive and resourceful person. However, without any introduction, it’s hard to know who she is or what credentials and experiences she drew upon to write this particular text. A second drawback for The Kitchen Paraphernalia Handbook is that it lacks any visuals that might aid the reader in knowing what devices are being discussed. Pictures, drawings, diagrams, and images could assist the reader in following the helpful tips and techniques offered by MacLeod. Some color could have also made the text more visually appealing and broken up the flow of black font against a plain white background. Although, the current aesthetic does seem to match a minimalist mindset. Regardless of any drawbacks, this thorough and comprehensive handbook is certainly a very helpful text. The reader will no doubt appreciate not only MacLeod’s recommendations for gadget substitutions, but also her extensive conversion information at the end of the text. The exact devices needed to hold all manner of measurements are listed. For example, if you need to figure out the right device to contain 7 cups, you could turn to one of four specific containers that you might have available. This feature may have most readers turning to this book time and again for cooking and baking. This book is the perfect tool to help you avoid buying way too many kitchen tools. The tips in this handbook are helpful for any minimalist or thrifty home cook. Keep this handbook on hand because MacLeod’s techniques can help any troubled chef out of a jam.